When I put out a call for holiday themed books to the publishers, I got all kinds of responses. 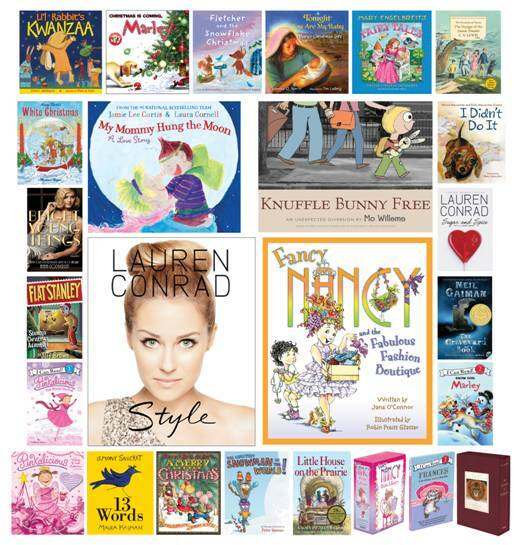 HarperCollins Children's Department has several recommendations for you! The ninth picture book by the #1 New York Times bestselling Jamie Lee Curtis and Laura Cornell is a celebration of unconditional love between a little boy and his mommy. Straight from Jamie’s heart, written with grace and sweetness, this is a book that joyfully illuminates the love that exists between mom and child, which sets the foundation for a healthy life. Bestselling, award-winning star Mo Willems brings one of the most beloved picture book series in recent memory to a close in a way that will surprise and delight his myriad of fans. This last adventure is an emotional tour de force, with pitch-perfect text and art, photos from around the world, and a stunning gatefold, culminating in a hilarious and poignant family drama no child or parent will be able to resist. The ultimate style guide, with never-before-seen full color photos of Lauren Conrad and her recommended fun and flirty outfits—a perfect gift book for all of Lauren’s many fans and for anyone looking for pointers from one of Hollywood’s most relatable yet glamorous stars. Fashion icon, clothing designer, television star, and #1 New York Times bestselling author Lauren Conrad returns with the third installment of the juicy L.A. Candy series. Full of the ripped-from-real-life plot twists that her fans love, Sugar & Spice is the perfect ending to this blockbuster teen series. In this très chic story from bestselling duo Jane O’Connor and Robin Preiss Glasser, Nancy shows once again that sometimes all you need is a little improvising to turn a fiasco into something fancy. 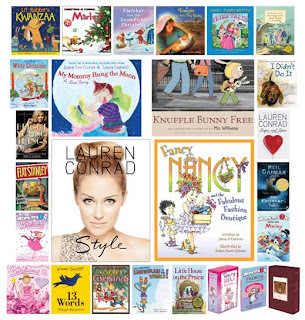 This charming Petite Library contains miniature jacketed hardcovers of the first fabulous titles in the Fancy Nancy I Can Read series: Pajama Day, The Show Must Go On, The 100th Day of School, and Every Day is Earth Day. A perfect gift for any Fancy Nancy fan! Here is a word book like no other! A glorious picture book collaboration from bestselling author Lemony Snicket and esteemed illustrator and New York Times columnist Maira Kalman. From Anna Godbersen, bestselling author of the Luxe books comes a new series set amid the decadence and excitement of the Roaring Twenties. A charming story that celebrates Kwanzaa with an adorable new character, Li’l Rabbit, as he discovers the true meaning of the holiday: the best gift is the gift of togetherness. A lively wintertime picture book perfect for readers who always want the biggest and best of everything! With vibrant and colorful artwork, author and illustrator Peter Hannan tells the hilarious story of a chinchilla determined to create a true snowy masterpiece. Fletcher the Fox, star of the acclaimed Fletcher and the Falling Leaves, is back for another seasonal adventure—and this time he discovers the wonders of Christmas! The week before Christmas is a time of new and exciting sights and smells—and it’s almost more than a curious dog like Marley can take! With this vibrant touch-and-feel book, young readers will be in on Marley’s mischief. Could it be that Marley is a natural snow dog? The world’s most rambunctious dog is back in this hilarious new I Can Read story from #1 internationally bestselling author John Grogan. Pinkalicious, star of the bestselling picture books Pinkalicious, Purplicious, and Goldilicious, enters the world of I Can Read with this story that will have young readers laughing out loud—until they get pink in the cheeks! This box of totally collectible treasures contains books, stickers, a color-it-yourself poster, double-ended crayons, and more—from the bestselling Pinkalicious book series! Since her debut in 1960, Frances has won the hearts of readers everywhere with her bold spirit and sweet nature. Now, in honor of Frances’s 50th anniversary, three of the most beloved Frances titles—Bread and Jam for Frances, Best Friends for Frances, and A Bargain for Frances are available in this boxed collection of I Can Read editions! Winner of the 2009 Newbery Medal, Neil Gaiman’s #1 nationally bestselling novel is an unforgettable, rich and enchanting tale of a boy growing up in the most unlikely of settings. This paperback edition includes a robust extras section that includes Neil Gaiman’s Newbery acceptance speech, his answers to reader’s questions, and additional illustration from Dave McKean. In 1897, eight-year-old Virginia O’Hanlon wrote to the New York Sun newspaper to ask a simple question: Is there a Santa Claus? The editor’s response was a stirring defense of hope, generosity, and the spirit of childhood. Now readers can believe in Santa all over again with this originally illustrated picture book that will make the story a perennial favorite among Christmas lovers young and old. Celebrate 75 years of Little House with this gorgeous jacketed hardcover edition of Little House on the Prairie, featuring Garth Williams’s charming interior art in vibrant full–color, plus fun bonus material! In their second ode to canine companions, this talented trio once again offers an irresistible glimpse into the mischievous canine mind. Captured here are adorable confessions and spirited accounts of the things that puppies do-and don’t do-while in search of love, adventure, and treats from the table. A Christmas alphabet picture book, with each letter illuminated in Mary Engelbreit’s beloved style. Readers can join in to celebrate the joys of the season—starting with A for the angel on top of their tree, to the X that marks each day off their calendar, Y for the Yule Log, and Z for the zillion ways Christmas brings cheer. With twelve beloved stories meant for reading aloud and more than one hundred glorious illustrations waiting to be discovered, Mary Engelbreit’s Fairy Tales is destined to become a favorite on any family’s bookshelf! The miracle of Christmas began with a mother and her child. With simple words and luminous paintings, the warmth and spirit of the first Christmas come alive in a book that is sure to be treasured by mothers and their young ones. The classic Yuletide ballad that has been spreading Christmas spirit since the 1940s is made new again in this magical holiday picture book with illustrations as fresh and beautiful as a winter snowfall. An energetic repackage of Stanley’s Christmas Adventure, one of six original chapter books based on Stanley and the Lambchop family, the beloved characters created by the late Jeff Brown. Stanley’s only holiday-centric adventure is chock full of Christmas delight, including a visit to the North Pole and a hilarious reimagining of Santa Claus! In time for the December 10, 2010 release of the “Voyage of the Dawn Treader” movie, the Chronicles of Narnia are presented in a deluxe slipcase edition, with luxurious specs and a full-color map and timeline, in celebration of the 60th anniversary of the beginning of Narnia. The bestselling Chronicles of Narnia Rack Box Set now has movie still images from the “Voyage of the Dawn Treader” film on the box! All books inside the box feature Cliff Nielsen’s cover art and the classic black-and-white interior illustrations by Pauline Baynes. The New York Times bestselling Chronicles of Narnia adult paperback now has a new movie still cover from the film “The Voyage of the Dawn Treader”, in theaters December 10, 2010! This volume contains all 7 unabridged books and has black-and-white chapter opener artwork by Pauline Baynes. The paperback digest edition of The Voyage of the Dawn Treader now has a movie tie-in cover, based on the new movie by Fox and Walden media, in theaters December 10, 2010! The Voyage of the Dawn Treader, C. S. Lewis’s beloved classic and the basis for the upcoming film, is now available in a special read-aloud edition. With simple text and photo stills from the movie on every page, this I Can Read book is the perfect choice for young Narnia fans! Which ones look the best to you?? You can read the other posts in this series here: Amish Christmas Books, Christmas Mystery Books, Christmas Romances, and Christmas novellas.